In the first part of this article, we explored the rationale behind Agile Scaling and briefly toured some of the popular Frameworks, with a specific focus on the Scaled Agile Framework (SAFe). In this segment, we will continue our ascent by examining some approaches for successfully leveraging SAFe. It may seem blatantly obvious, but a prerequisite to scaling Agile requires that the organization already has an existing set of relatively mature Agile teams upon which to build. Simply put – without first having established stable Agile teams, there is nothing to scale! When examining the SAFe website, it becomes apparent that we are dealing with a very broad, deep, and rich body of knowledge. In fact, rather than reinventing the wheel, SAFe borrows (or shamelessly steals) from many other proven approaches, including - Lean Thinking, DevOps, team-based Agile, and Business Agility. So, whether or not you are explicitly using SAFe, the Framework is a valuable source of information for all things Lean and Agile. The Framework itself provides a good general guide, the “SAFe Implementation Roadmap,” for selecting and adopting patterns of implementation. In fact, the Roadmap promotes a robust set of recommended steps for planning and executing a transformation. When starting out, clearly one of the key considerations is the scope of adoption. This will dictate both the organizational footprint and the pace of change. From a SAFe perspective, the choices align with the four levels of the model: Portfolio, Large Solution, Program, and Team. Depending on the needs, capabilities, and appetite of the organization, these levels may be used in various combinations (configurations) to set the broad organizational context and the plan for executing change. All expeditions require good leadership. Acting as sponsors and enablers, senior leaders should not delegate or abdicate responsibility for enabling change. In fact, they are pivotal to enacting the change. One of the first steps in planning and preparation is to ensure that senior management is sufficiently educated so that they can set appropriate goals, commit resources, support the launch of the expedition, and make informed choices along the way. Another major consideration is the formation of a guiding coalition of change leaders. In SAFe, this body is referred to as the “Lean Agile Center of Excellence” (LACE). The composition of the LACE is key to ensuring that all changes are grounded in the real world. They should be knowledgeable in the Framework, cross functional with diverse skills, and representative of all the constituencies that are targeted for change. When expedition teams tackled Mount Everest, they hired local Sherpas to guide and assist them. Using this as a metaphor, the equivalent role in the Agile world is made up of coaches and/or advisory consultants. These specialists should have a deep knowledge of the framework itself, and more importantly, have the experience and skills to guide a team up the face of the mountain. Ultimately, it is important to bear in mind that we are looking to change behaviors at the individual, group, and enterprise levels, so be realistic in setting expectations and goals! Establish a route (roadmap), manage in increments (through a backlog), and adapt and change based upon short iterations. In other words - use an Agile approach to drive SAFe adoption! Sometimes, once we start to climb, the actual rock face is not as expected, so deviations are required. Likewise, organizations should be open to tailoring the Framework and their approach. Simply put - don’t do something if it makes no sense. Experiment and consider alternatives – but always ensure that you have a rationale for whatever you do change. Having said that, some caution is required. Frameworks typically consist of interdependent and mutually-supporting elements, so if you substantially modify one element, you may end up inadvertently breaking something else. So, after struggling up the perilous rock-face, we have now completed our ascent and successfully reached the rarefied heights of the summit. And, as we proudly stand at the pinnacle and survey the horizon beyond, what do we see? There, laid out before us, is a limitless vista, containing an extensive range of new mountains stretching way out to the horizon. We have achieved much, but just like life’s journey (and the relentless pursuit of excellence), we have many more mountains to climb. Did you miss the beginning? 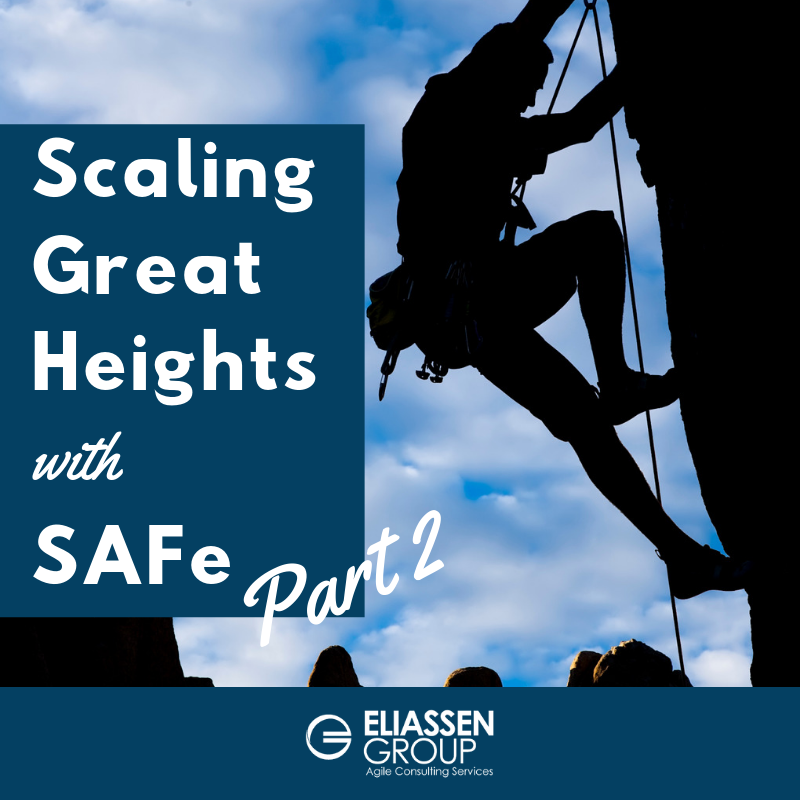 Read Part 1 of Scaling Great Heights with SAFe.